Posted May 7, 2014 by finnfemme & filed under Daily Life, Frugal Living, Health. There’s been a lot of talk about climate change ever since the White House released its report, The National Climate Assessment. To me it seems a bit overwhelming, with all the talking heads pointing fingers, blaming others and debating endlessly. What I’d like to see more of is how we can help the planet as individuals. Simple things that we can DO in each of our lives that collectively will have a big impact. In my life I feel that the practice that has had the most impact is the simple act of using a clothesline, or air-drying your clothes. 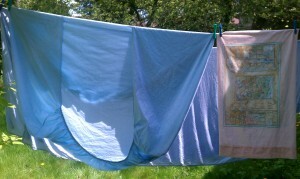 I have been a 100% air-dryer for the past 8 years, using a clothesline outside and drying racks inside. The gas/electric clothes dryer uses a tremendous amount of energy, is a fire hazard, and is really rough on your clothes. You know the lint that is caught in the lint trap? That is fiber that is wearing off from your clothes and linens. You’re supposed to clean your lint traps regularly – even the ones inside your dryer – and the vent that leads to the outside. Lint is tremendously flammable and is the cause for many house fires. 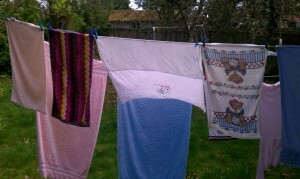 I really look forward to spring and the warmer weather when I can finally hang my laundry outside on the line! After a long winter of maneuvering indoor drying racks, I relish the opportunity to do some good old fashioned solar drying. There is nothing more intoxicating that the smell of freshly clothesline-dried laundry. Laundry detergent manufacturers have tried in vain to chemically reproduce the poignant scent, “Linen Fresh!“, but there is absolutely no duplicating it. Stuff dries amazingly quickly out on the line, especially if there is a breeze. Towels and sheets get a chance to stretch and air out, instead of being wadded up in the dryer. There is a certain ‘stiffness’ factor when dealing with air-dried laundry. 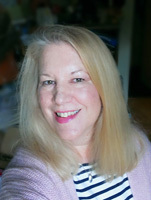 But one soon gets used to it, and I actually find it preferable to the limp, chemically-fabric-softener-dryer-sheet coated laundry that comes out of the dryer. So instead of blaming, arguing, denying or worrying about climate change, you can actually start doing something about it in your own life. I feel that if we all air-dried our laundry, the world would be a much better, happier place. For who cannot smile when seeing laundry billowing in the breeze?